Year after year, vinyl siding remains the Number 1 Choice for most homeowners in America. Vinyl installation costs range from $6,000 to 9,500 for a 1,500 sq.ft. ranch home. This material offers an unbeatable combination of durability, wide range of colors and styles as well as an affordable price. Lets take a look at the 5 most popular types of vinyl siding, along with prices, best features, and top brands. For a quick estimate of how much it would cost to install vinyl siding on your house, use our Siding Calculator. 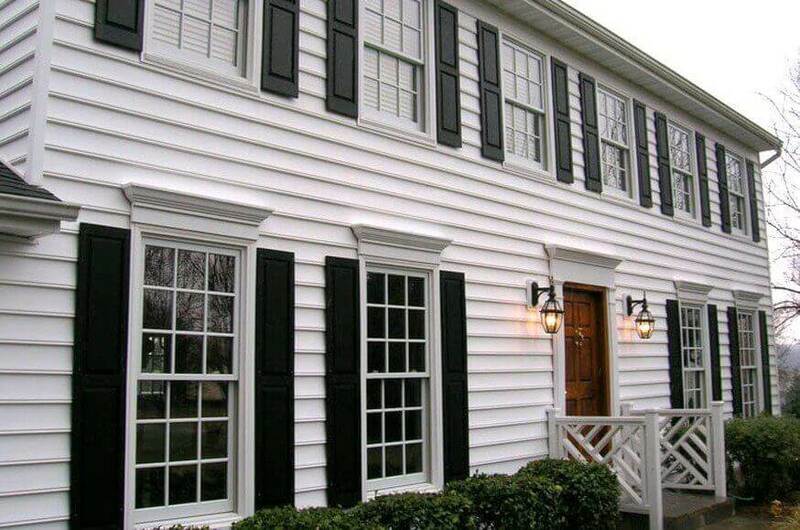 Classic lap siding, also known as Clapboard, is the most popular style among homeowners. It is basically horizontal panels that resemble cedar wood horizontal siding. They come in three thickness groups, which make it low-end, mid-range and high-end materials (thickest boards). Each board is straight and overlaps the one below it. This is the oldest and in fact original siding style in America that dates back to the 1700’s. Today, there are many profiles and variations of clapboard siding available. Material prices average $1.00 – 1.5 per square foot. Its possible to get budget quality vinyl lap siding for as low as $0.75-0.90 per square foot. Higher – end vinyl brands can cost as much as $2+ per square foot.. These premium products cost more because they are made using better quality raw materials, thicker, more durable boards, and fade resistant color technology. Depending on the complexity and quality of installation, professional labor rates to install lap siding range from $1.75 – 2.5 per square foot. Thus, you can easily put up vinyl lap siding for $3 – 4.5 per square foot. Overall, vinyl siding prices are the lowest compared to other materials, making it an ideal choice for homeowners looking to save money on new siding. The biggest advantage of horizontal lap siding is that it makes a great match for any house architecture. You can either side the entire house with it, or use it in combination with other types of siding for more visual interest. 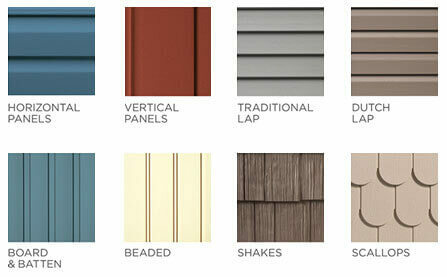 There is also a very wide range of color options and manufacturers that offer various lap siding product lines. Home Depot’s Vinyl Lap Siding by Ply Gem is the low cost, no frills option. Its available in 3 colors and costs $147.90 per carton. The boards are 0.40 inches thick and withstand winds of up to 165 mph. They are designed for easy and fast installation and are ideal for DIY savvy homeowners. 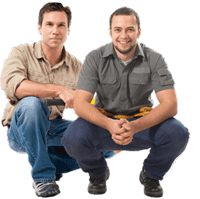 You can get much better quality and selection from CertainTeed. There is either Smooth or Rough Cedar finish to choose from, along with 12 colors and two thicknesses (0.044 or 0.046). Lap siding does not have to look cheap or bland. Hardwood Valley II by Kaykan delivers an exceptional looking vinyl panel that replicates the look of stained cedar wood. The boards boast a deeply textured wood appearance together with variegated color blends that create an authentic weathered look. In addition to curb appeal, you also benefit from premium board thickness, UV resistant color technology and a limited Lifetime warranty. Dutch Lap siding, also known as “German Lap” or “Cove”, is a variation of the classic clapboard siding. Its distinguished by a slight curve or channel that runs along the top edge of the panel. As a result, it has a more rustic, log-like appearance that is reminiscent of Colonial style architecture. Its a great fit for Colonial, Bungalow or Cape style houses. When it used to be made exclusively of wood, Dutch lap siding was considered to be a premium product, because it took more skill and time to carve the groove or curve along the edge. Today, you can easily achieve the same artisan look with vinyl. If you are looking for a budget friendly product, consider Transformations by Ply Gem sold at Home Depot. It is available in a white color right in the store, but you can order it in 13 different colors. It features 3 profiles (Double 4 in., Double 5 in. and Double 4 1/2 in. ), and 0.40 inches board thickness. Smart interlocking design allows for easy installation that can be done without hiring a siding a pro. HeartTech by Provia is a much better quality Dutch Lap siding. Its thicker than the Transformations boards – 0.44 inches, which makes them more durable. There are 4 profiles and 30 colors to choose from. Also, the oak wood grain impression created a more upscale look. Another huge advantage is that this siding is manufactured with a double ply nailing hem that provides superior tear resistance in high wind conditions. Beaded siding profile is a popular variation on the classic clapboard style. Its characterized by a distinct V groove that runs along the bottom of the board. This design creates a shadow line between the face of the board and the rounded bead. By contrast, in the Dutch Lap profile, the groove runs at the top of the board. Beaded profile is a great match for classic architecture, such as Colonial, Bungallow, Cape, or Victorian. Material prices range from $1.30 – 2.25 per square foot depending on quality and thickness of the boards. A quality option is Somerset Coastal Beaded Siding by Georgia Pacific. It comes in 11 colors and features a full beaded 6.5 inch lap. The boards are durable, with 0.44 inch thickness and wind uplift resistance of up to 165 mph. 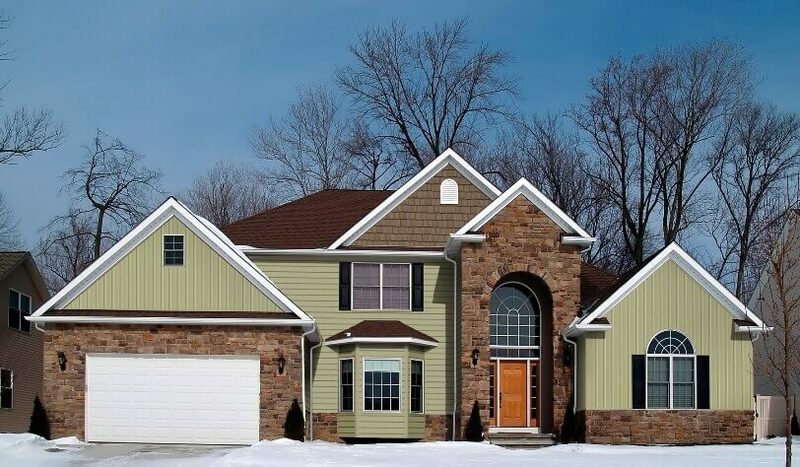 A more premium, designer siding is Maxim Beaded by KP Vinyl. Choose from 15 beautiful colors made with UV ray inhibitors, a very durable, extra thick 0.46 inch board, that can resist winds of up to 201 mph. KP also offers a 25 year Fade Resistance Warranty and a Limited Lifetime Warranty. Shakes and shingles offer a rustic and upscale look that so many homeowners love. While natural wood shake siding is very expensive, its possible to get a similar look with vinyl for a lot less. Different manufacturers offer a variety of sizes, shapes and colors of vinyl shingles and shakes. This type of siding is most often used as an accent, but can also be installed over the entire house. Vinyl shake siding is on the higher end of the price spectrum. Most products cost $2-3.5+ per square foot. Moreover, installation is more labor time consuming and complex compared to lap siding, so there is also a premium charge for labor. Your total installation cost will be about $5-7.5 per square foot. One of the biggest advantages of cedar impression siding made from vinyl, is that unlike real wood, it will not rot, or be susceptible to insects and mold. Vinyl shingles also require minimal maintenance, while wood siding needs to be re-stained or re-pained at least every 5 years. If you want truly beautiful vinyl wood shakes or shingles, there is The Foundry (purchased by Tapco International). The company manufactures an impressive variety of products: split or staggered shakes, as well as 7 inch perfection shingles. They achieve an authentic look of split shakes by using mold made from real cedar. Another company that makes authentic looking vinyl wood shingles is Novik. They offer the following styles: PerfectShake, Hand-Split Shake, Staggered Edge, and Rough Sawn 8 inch Shake. Color options also abound, including: natural stain, blended and solid colors. Homeowners that prefer to dress up their siding and enjoy unique details and elements can install vinyl scalloped siding. Its an ideal fit for Victorian style homes. However, it also works well if you want to accentuate your home’s gables, windows, or eaves. On average, material prices start at $2.5 per square foot. You can purchase inexpensive budget quality vinyl scalloped siding from Lowe’s, its manufactured by Georgia Pacific. The price is 19.85 per panel (16.375-in x 54.75-in) and there are 9 colors available. If you want better quality half round vinyl shingles, you can get them from Royal Building Products These shingles offer strong impact, fade and warp resistance and come in 4 beautiful colors. 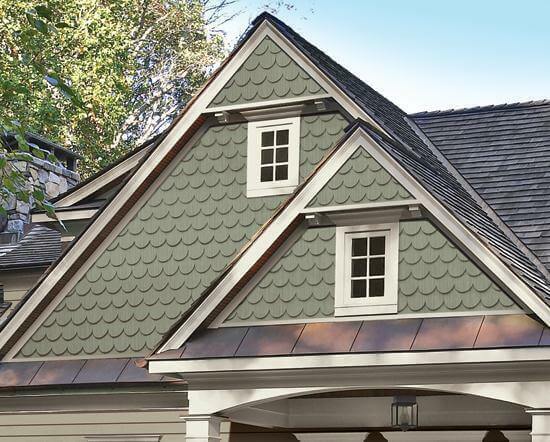 Another high quality scalloped siding option is Pelican Bay One by Alside. They offer panels of extended length with concealed fasteners for a much better appearance. Moreover, this siding has stayed in tact during Category 5 hurricane winds, according to independent testing. As the name suggests, this siding is installed vertically. It replicates the centuries old, natural wood board and batten siding. There are wide sections (boards) and narrow raised strips (battens). It is possible to clad the entire home with board and batten boards or use them as an accent on a house clad with horizontal siding. Many contemporary farm-house style homes make great use of this siding style. In terms of pricing, its similar to traditional lap siding, around $1.5-2 per square foot. This puts it on the lower end of the price spectrum compared to other vinyl products. One of the greatest benefits of board and batten siding is that it visually increases the height of the house, because it runs vertically. Another, is that it lands a more modern aesthetic to an otherwise outdated house exterior. If you want an authentic wood look, consider Northern Star Board and Batten by ABTCO. This beautiful siding features a rough cedar textures, 16 low-gloss colors with UV ray inhibitors, and extra thick 0.46 inch boards. Another high quality option is board and batten siding by Norandex. It boasts a unique early American look where a wide board is accentuated by a narrow batten. The panels are exceptionally thick – 0.052 inches, and 14 low gloss color options. Norandex offers one of the best warranties in the siding industry: Limited Lifetime Transferable Warranty with ColorHold® Lifetime Fade Protection. This siding is sold exclusively through ABC Supply Inc across the US. Vinyl siding boasts many advantages that cannot be matched by other types of more expensive materials. With constant technological advancement, the quality and curb appeal of vinyl continue to grow and improve. 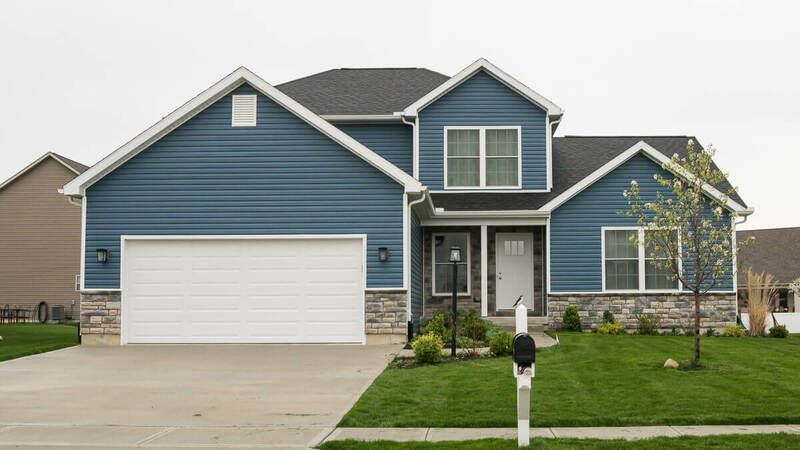 So whether you need to replace siding on a budget rental property or an expensive home, you can find a vinyl siding that can fit your needs. Here is a run down of vinyl’s greatest advantages, as well as down sides to be aware of. Nice to see all the photos and descriptions of vinyl siding. So many choices and companies out there, it’s confusing when one first starts the search!